What is the best relationship between fathers and sons? Certainly not the one that was characteristic of ancient Roman society. The pater familias, the father of the family, had literal power of life and death over everyone in his household, including his sons and daughters. Although rarely fully deployed during the imperial period, such power was absolute, and backed by the law. 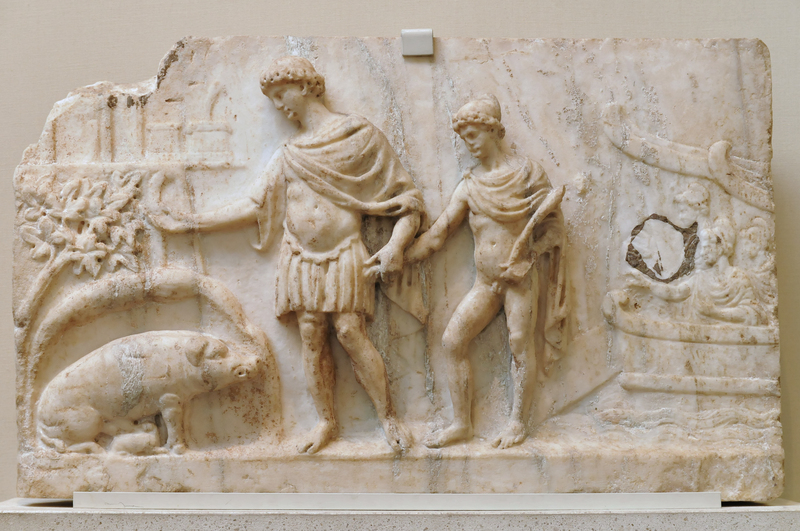 It is against this cultural backdrop that Liz Gloyn — in the fourth chapter of her The Ethics of the Family in Seneca — discusses the Stoic approach to father-son relationships, through the work of the Roman Stoic. Indeed, Seneca wrote an entire book, De Vita Patris, specifically about his father, but it unfortunately has not survived. So Gloyn focuses on De Beneficiis (On Benefits) as her main source in this regard. Despite their power within the household, Roman fathers were expected to take an interest in the moral development of their sons (daughters, of course, were hardly in the picture, with the due notable exceptions). One way of doing so was to write treatises on certain topics, addressed to the next generation. Seneca himself, together with his two brothers, received collections of legal writings from Seneca the Elder, which were meant as instructive for them. Fathers, Liz notes, were not simply expected to function as teachers, but also as moral role models, after whom their sons could pattern their own behavior. In fact, exempla, i.e. the examples offered by one’s ancestors, were meant to stimulate a sort of cross-generational competition, whereby young men would aspire to themselves become examples for future generations. Now, the Stoics were big into role models, and so the idea of exempla should have fit nicely with their approach to moral development. The problem is that classic Roman exempla were focused on political achievement and service to the State, not on virtue. In Stoicism, of course, politics and service are preferred indifferents, to be pursued only if they bring about virtue. Moreover, the father-son relationship in ancient Rome was very much hierarchical, as mentioned above, which did not fit well with the Stoic conception of equality among moral agents. According to Gloyn, Seneca once again deploys the Stoic notion of oikeiosis (moral appropriation, concerns for others) in order to completely reinterpret how fathers and sons should relate to each other. The starting point is an analogy between virtuous interactions and playing catch with a ball, introduced by Chrysippus, and which Seneca appropriates. In the game, players have to cooperate to keep the ball in play, and moreover they have to adjust their passes to the physical characteristics and abilities of their fellow players. In a similar fashion, “players” in the “game” of moral improvement have to adjust their interactions to the level of moral development of the people they interact with. Fathers, being naturally more advanced, will largely play a role of teachers to their sons, but the play is still reciprocal — both parties learn and improve — and the goal is to augment everyone’s proficiency, not just the student’s. And the major problem is the internal disposition of the agent. One should accept benefits with gratitude, and should give them because he wants to help others, not because he is expecting a return, either directly or indirectly. In the latter case, we speak of a business transaction instead. What is that “something better” than life? The phrase signals to the reader a switch to a Stoic perspective, since the answer is virtue. Seneca continues by making an analogy between the benefits given by a father to his son and those that the son may receive from a doctor (restored health), or a sailor (being brought somewhere). By the very fact that he makes the analogy, Seneca is radically undermining the traditional view, saying in effect that the father-son relationship is no different in kind from the relationships we have to all other people — a clear example of the principle of oikeiosis. From the point of view of oikeiosis, with its concentric circles of concern made famous by Hierocles, the relationship between father and sons is special not in a qualitative sense, but only because it begins early on in life, and therefore plays an important role in our early moral development. Again, this is radical, even from a modern perspective. We still cling today, in a sense, to the old Roman idea that one of the most important things fathers give their sons is wealth, in the form of paying for their education, and eventually of inheritance. For Seneca, instead, those are just preferred indifferents, and the true legacy of a parent is bringing his son in an oikeiotic relationship with the parent and then with the rest of the world. Needless to say, everything we have seen above ought to be applied — in modern context — to the relationships between both mothers and fathers and their sons or daughters. The theory is precisely the same. There is one more important thing noted by Liz in this chapter. There are two additional works by Seneca where he uses the father-son relationship for moral purposes within a Stoic framework, and they are rather surprising. De Clementia is a book dedicated to the young Nero. While it is often seen as yet another example of Seneca’s hypocrisy and support of the increasingly tyrannical regime, it is actually a thinly veiled threat to the emperor himself: Seneca uses the example of a good father as analogous to the role the emperor should play within the State. But he then contrasts this with the case of a tyrant, who will fear being killed by his own bodyguards. The second relevant work other than De Beneficiis is De Ira (On Anger), where the figures of fathers and rulers are set in opposition to each other. Seneca goes through five exempla, in each of which a ruler kills the sons of some of their citizens, with the predictably ensuing consequences, when the fathers react to the deaths of their sons. As I’ve written before, and as he himself admitted, Seneca was no sage. But one cannot help the feeling that he doesn’t get enough credit for just how bold he was in some of his writings in speaking truth to power, in an environment, remember, where plenty of others had lost their lives for doing the same. This entry was posted in Seneca, other, Social living and tagged The Ethics of the Family in Seneca on June 8, 2018 by Massimo. Excellent post. I’m loving this series and your careful coverage. In Seneca the Elder’s Controversies he seems to praise his youngest son Mela for actively pursuing his interest in philosophy while criticizing our Seneca and Novatus for pursuing political careers – this has always seemed strange to me as in Seneca’s Moral Letters the impression we get is that his father did not approve of philosophy and the time Seneca spent studying and his Pythagorean practice of vegetarianism. To be honest Seneca’s relationship with his father is hard to pin down. There is respect shown, but more as a matter of course – whereas Seneca’s affection for his mother comes through unashamedly. Further in the Moral Letters there are numerous pieces of advice to Lucillius to ignore the opinions and even praise he receives from his family and instead focus upon his own inclinations. Hi Max – the Moral Epistles have a very different take on all of these issues, as I argue (and Massimo will be summarising) in chapter six! you mean this current post? The best way is just to share it as a link, but your browser should be able to generate a pdf, which you can then send via email. More a question for Liz Gloyn: On the relationship between Seneca and his father: I sense throughout Seneca’s corpus whenever he talks of his father or father’s in general a mild sense of friction, a prickle that tells me that this was not an easy relationship for him. There are no passages I could cite now from memory but more the impression that his father was a harsh demanding man – maybe even that he did not treat his wife very well. Do you agree? Hi Max – yes, I agree that there is definitely some tension in mentions of Seneca the Elder. Two obvious examples spring to mind – in the Ad Helviam, he talks about his father not letting his mother study philosophy and categorises this as the one problem with his father’s upstanding traditional morals; in the Moral Epistles, he mentions his father using a crack-down on vegetarians and other suspicious types to persuade him away from Pythagoreanism. I’m not sure I’d go as far as saying that Seneca the Elder and Helvia had an unhappy marriage, but it’s obvious that the subject of philosophy was not a neutral one in their house!